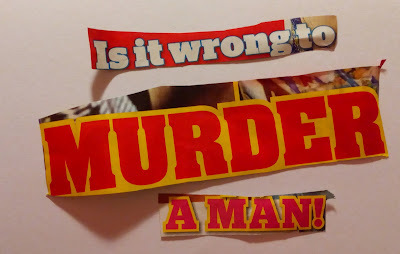 Writings Of An Autistic Woman: Question: Is It Wrong To Murder A Man? 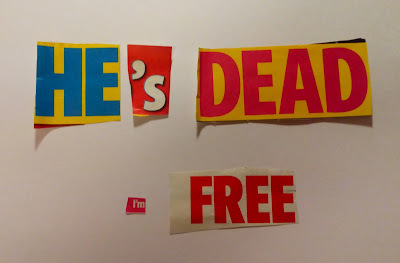 Following on from my grumbling and rebellion at prompt 13 from thinkwritten.com here's prompt 14. I could apply some of my worries here but must admit that it's been an enjoyable challenge. Looking ahead I foresee more instances of rebellion. The found poem: Read a book and circle some words on a page. 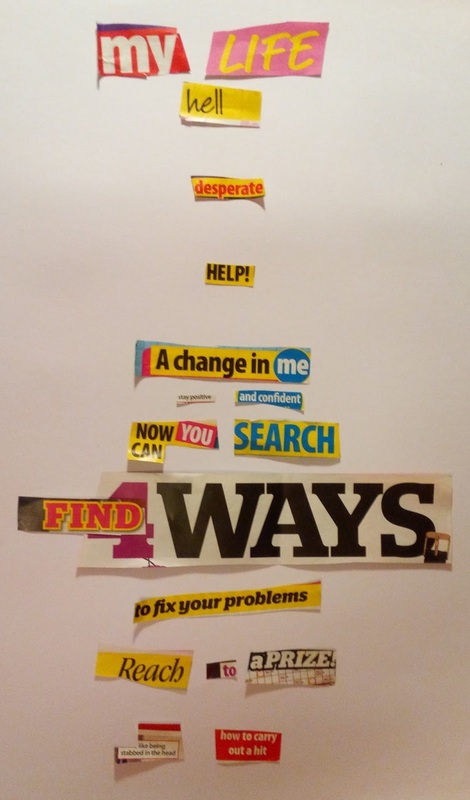 Use those words to craft a poem. Alternatively you can cut out words and phrases from magazines. Last Saturday I dragged myself out. I needed to go somewhere. Urgently. That day I'd been meant to go to a women's creativity and spirituality group. I'd finally plucked the courage to attend and it was important to me. For reasons that don't need discussing here attending wasn't a viable option. Let's just say that I was treated badly and, until things changed late the night before, illegally too. I was hurt and fragile and staying at home would have felt like defeat. However, in my fragile state, energy was lacking. I took an easy option. A bus to Blyth. I'd read on the bus and look at the fields. Then Blyth would offer me happy diversions. Charity shops, cafes, and a chance to sit myself by the river with a portion of chips. I could manage that. So I caught the bus and sat on the front seat, top deck. I found it there. A copy of That's Life magazine. A glossy mix of sad stories and triumphs. If you're interested to read it, it's the issue dated 12th January 2017. I took the magazine home thinking that maybe I could cut it up for something. Make a collage. Then I saw this writing prompt changed the plan. That's Life magazine could become my poem. 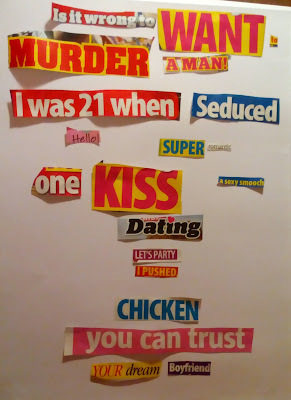 So I set to work last night cutting out words. Today I put them in order. The result was, not coincidentally, something that could have come out of the pages of That's Life magazine. Balanced formatting of this would be possible using a word processor. It's a near impossibility using the Blogger web pages. 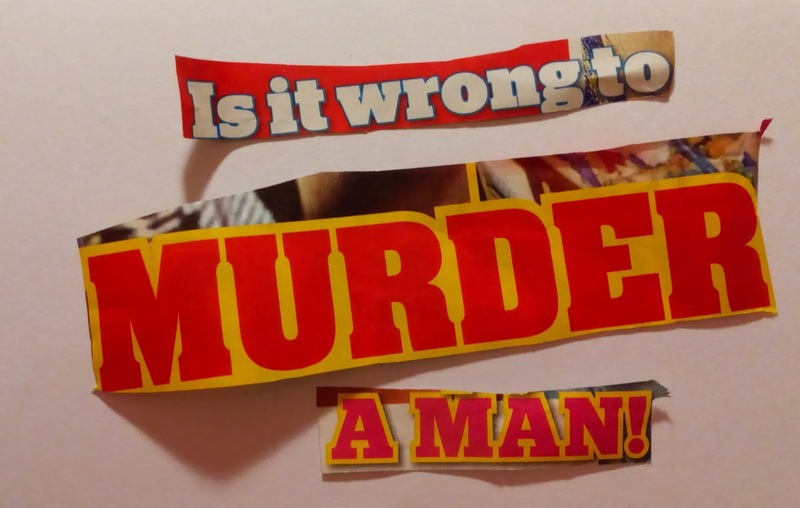 Is it wrong to want to murder a man? You can trust your dream boyfriend." Paralysed ... I LET him do it. "You look like a tramp. how to carry out a hit.